The RCAF Flyers hockey team in action against Sweden's national men's hockey team at the 1948 Winter Olympic Games in St. Moritz, Switzerland, 30 January 1948. 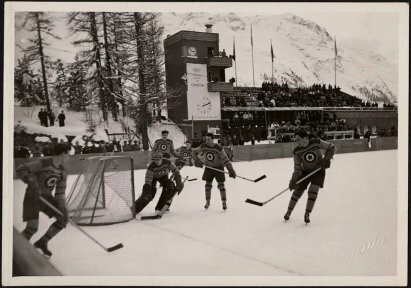 The RCAF Flyers hockey team on the players' bench during a game against the Swiss national men's hockey team at the 1948 Winter Olympic Games in St. Moritz, Switzerland, 8 February 1948. 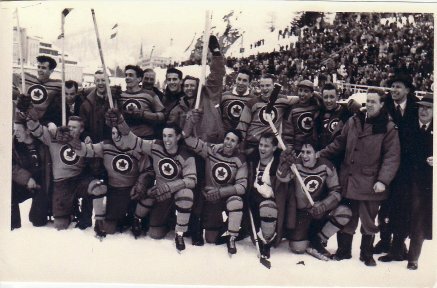 The RCAF Flyers celebrate their Gold Medal win over Switzerland on the outdoor rink at St. Moritz in 1948. Rear row (left to right): André LaPerrière, Hubert Brooks, Andy Gilpin, Ted Hibberd, A. Sydney Dawes, head of the Canadian Olympics Association, Pete Leichnitz, Irving Taylor, Wally Halder, George Mara, Murray Dowey, George McFaul, Frank Boucher, Sandy Watson, and George Dudley, head of the Canadian Amateur Hockey Association. 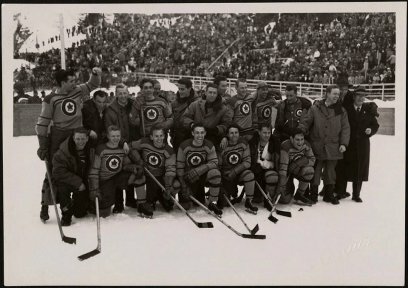 Kneeling in front (left to right): Roy Forbes, Orville Gravelle, Reg Schroeter, Ab Renaud, Patsy Guzzo, Louis Lecompte and Frank Dunster. 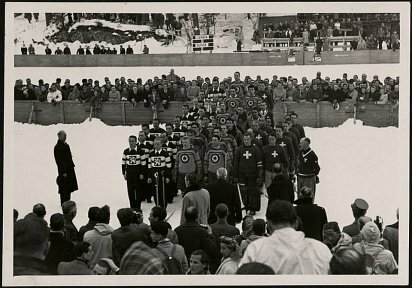 PHOTO: DND The RCAF Flyers representing Canada, winners of the ice hockey gold medal, with the Czech national team (silver medallists) and the Swiss national team (bronze medallists) on the winners podium at the 1948 Winter Olympic Games in St. Moritz, Switzerland, 8 February 1948. 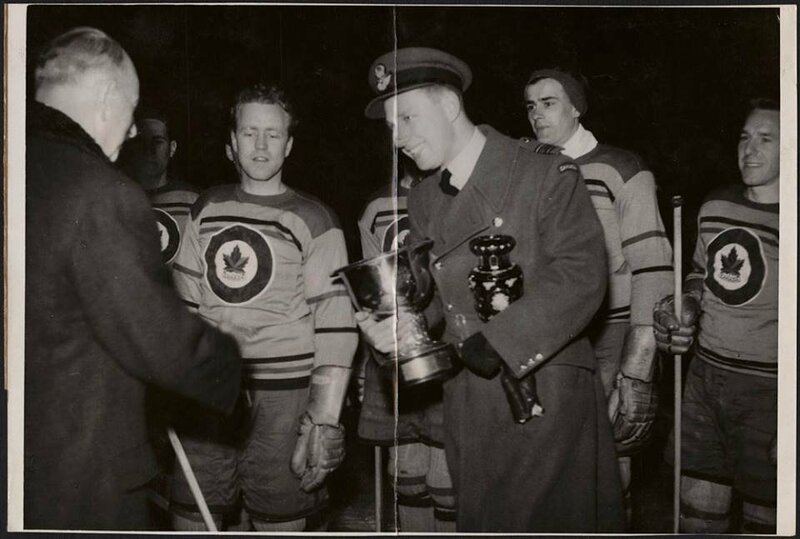 Dr. A.G. "Sandy" Watson, manager of the RCAF Flyers hockey team, receiving the World Hockey Championship trophy, at a game against the Czech national team in Prague, 17 February 1948. 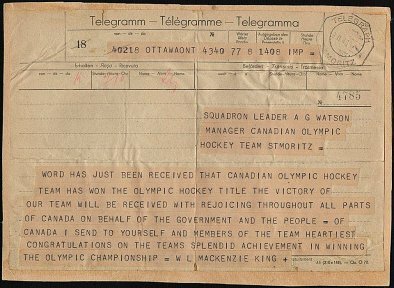 Telegram of Canadian Prime Minister W.L. 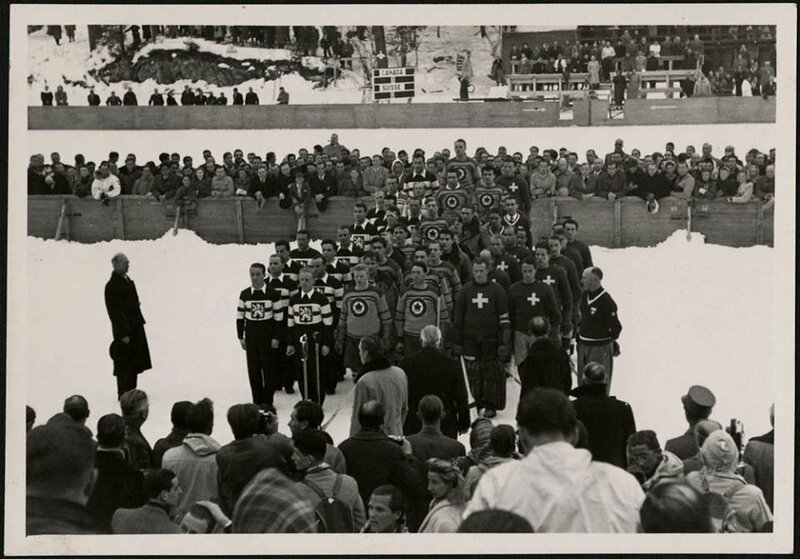 Mackenzie King congratulating the RCAF Flyers on winning the ice hockey gold medal at the 1948 Winter Olympics in St. Moritz, Switzerland, 9 February 1948. 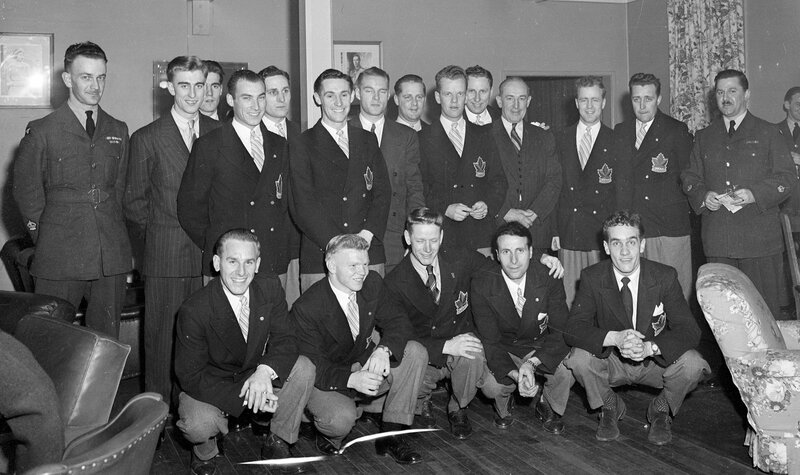 The Olympic Champions, RCAF Flyers, received a tremendous ovation onThursday, April 8, 1948, at the Sergeant's Mess located in Ottawa's Beaver Barracks. 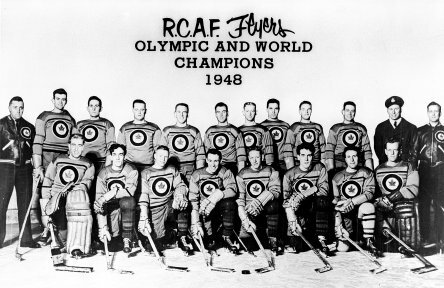 Front row (left to right): Reg Schroeter, Orval Gravelle, Roy Forbes, Patsy Guzzo and Ted Hibbert. Standing (left to right): Warrant Officer Class 2 W.H. Fader, vice-president of the mess. 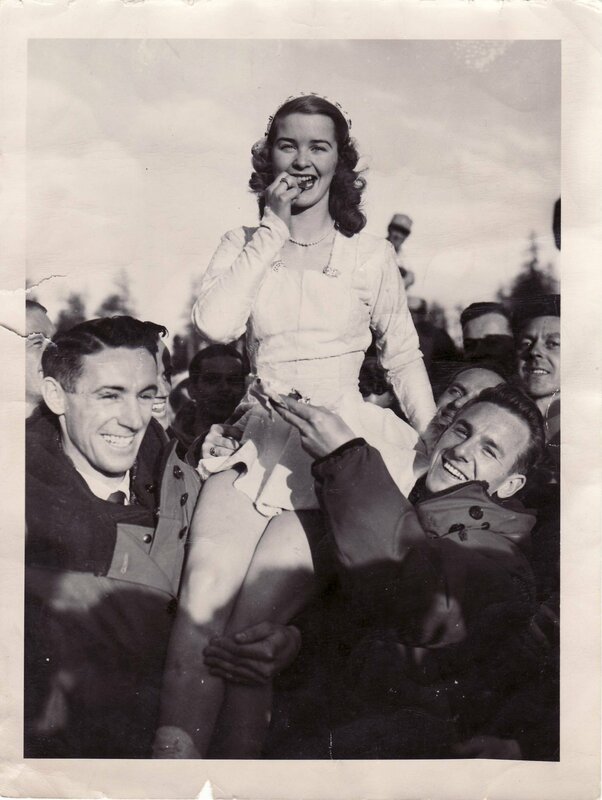 Murray Dowey, Pete Lietchnitz, Hubert Brooks, Frank Dunster, Ab Renaud, George Mara, Louis LeCompte, Ross King, Sandy Watson, George "Buck" Boucher, Frank Boucher, Corporal George McFaul and Warrant Officer Class 2 Colin Campbell. 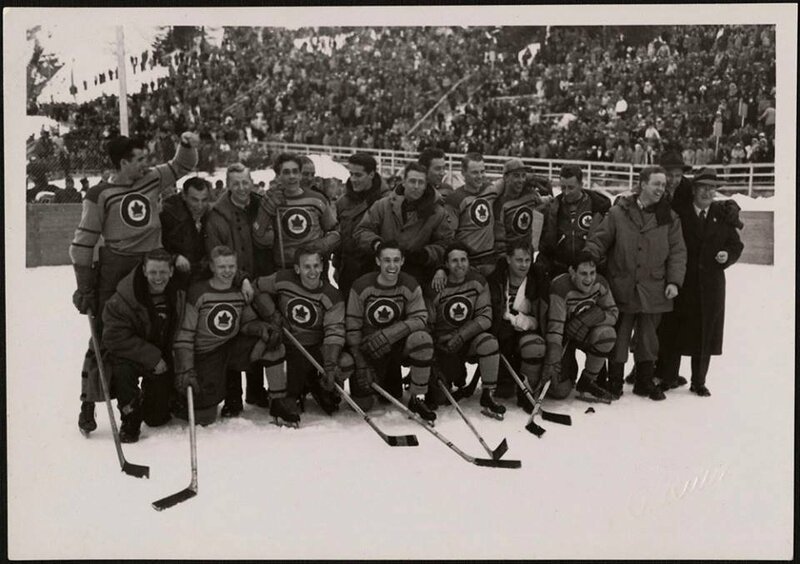 Absent from the photo are André Laperrière and Wally Halder. 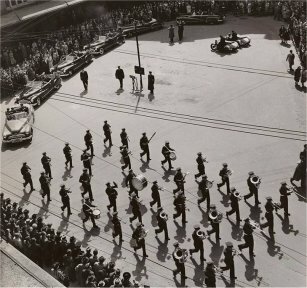 PHOTO: DND Parade in Ottawa in honour of the RCAF Flyers, ice hockey gold medal winners at the 1948 Winter Olympic Games in St. Moritz, Switzerland, 7 April 1948. 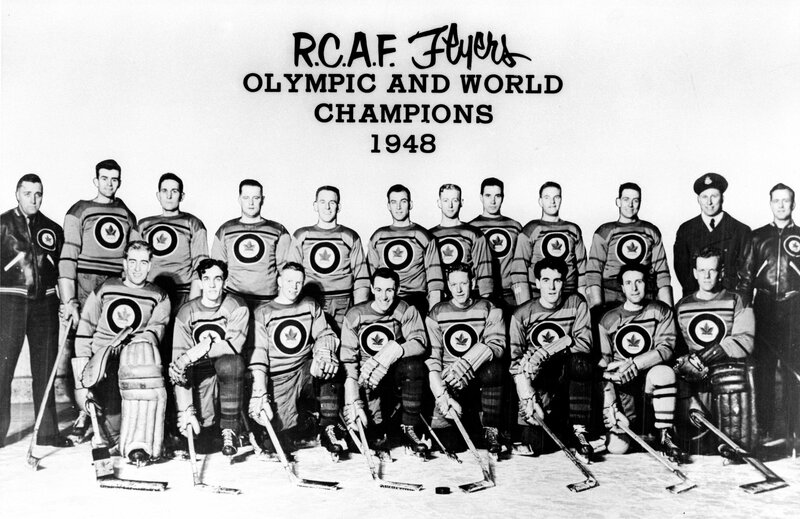 ~ February 7, 2014 ~ by Vic Johnson The Air Force won gold in February 1948 when the RCAF Flyers hockey team triumphed at the Olympic Winter Games held in St. Moritz, Switzerland. They had not been expected to win anything and in fact were a bit of an embarrassment to some. 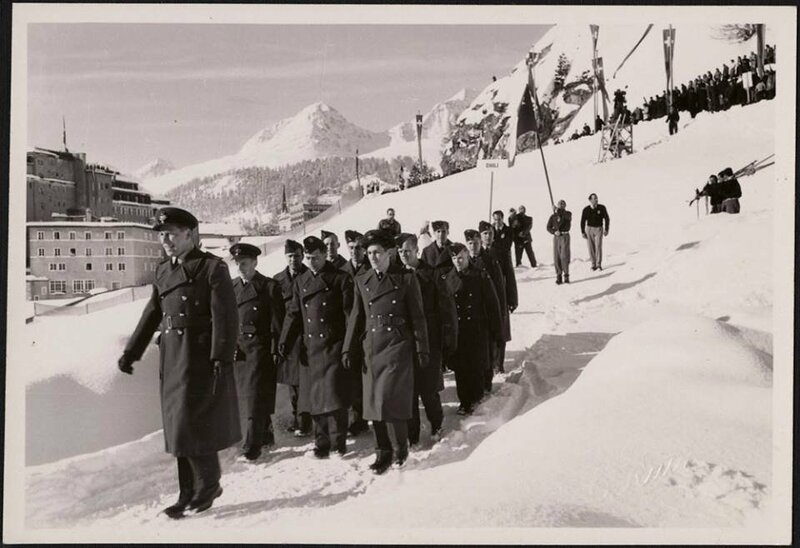 The 2014 Olympic Games in Sochi, Russia, begin today. 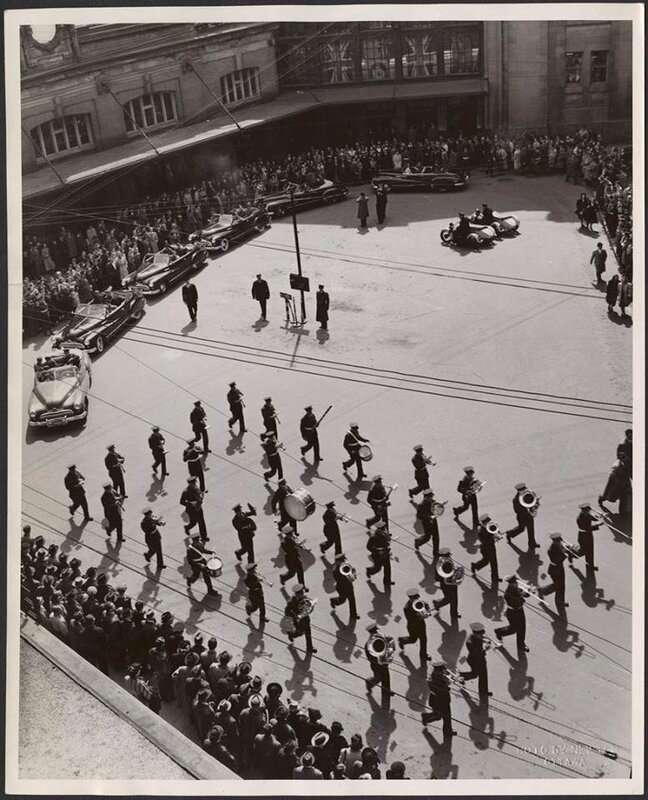 But let’s take a moment to turn the clock back to 1948. 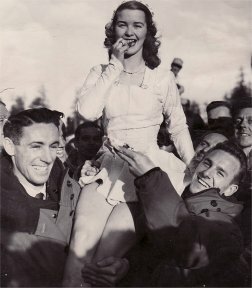 A famous photograph of a joyous Barbara Ann Scott being hoisted on the shoulders of team mates Ab Renaud and Reg Schroeter became the iconic image of the 1948 Games. The two Flyers team mates were then presented with replica team jerseys by Dean Black, executive director of the Air Force Association of Canada, on behalf of the association, to wear while dropping the puck for the next evening’s NHL hockey game between the Ottawa Senators and the Montreal Canadiens. 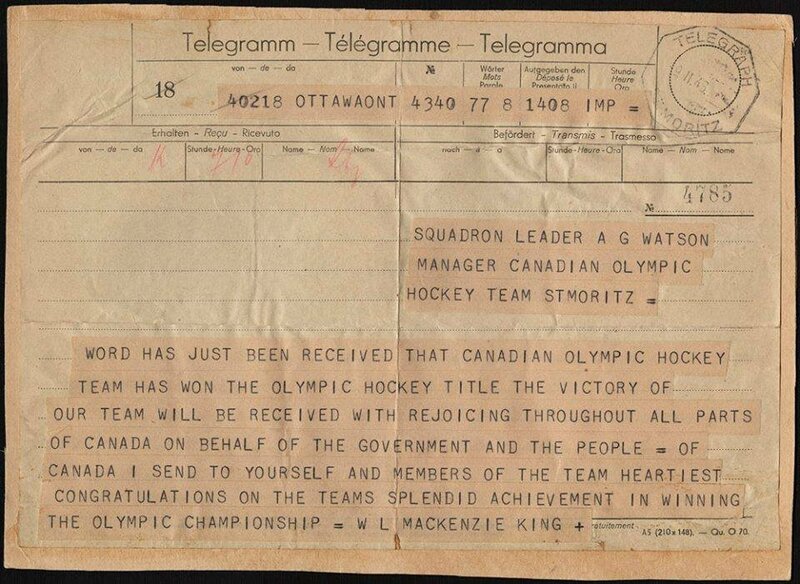 With files from the official Canadian Olympic Team website. Master Warrant Officer (retired) Vic Johnson was a Canadian Armed Forces photographer and is former editor of Airforce magazine.